We’ve all heard it: a disgruntled toddler claiming a toy with a sharp “Mine!” Object ownership is a major part of children’s social development in the toddler years. At this age, young children have begun to grasp the concept of owning an object: their beds, clothes, toys, and books all belong to them. However, these children have not yet separated the idea of possession—holding an object—with the idea of owning an object. This is when sharing disputes happen. When toddlers struggle to share, it is often because one toddler has claimed ownership of a toy, but then another child comes into possession of that toy. If Jacob thinks that he owns the teddy bear, it doesn’t matter that he put it down and walked away from it; Claire picking up the bear and playing with it means that she has stolen it from his possession. He then goes over and takes it back by force, which upsets Claire and causes her to feel it has been stolen from her, so she hits him. It’s a vicious cycle. So how should parents and caregivers encourage sharing in these children? Thankfully, Dr. Donna Wittmer and Deanna Clauson have some answers. Their book From Biting to Hugging examines common conflicts that crop up in toddler classrooms. With simple vignettes that display common classroom scenarios and clear explanations of toddler psychology, this book is a must-have for any early childhood teacher. Here are some of their tips for dealing with sharing problems among toddlers. Wittmer and Clauson describe conflict as happening on two levels: the content level and the relationship level. The content level addresses what is happening, in this case that a child took a toy from another child. The relationship level focuses on who it happened to. To address a sharing problem on the relationship level, a teacher must ask the children involved what they are thinking and feeling. In the case of toddlers, these questions may be needed to prompt them into recognizing their feelings. In the above instance of Claire and Jacob, for example, the teacher may say, “Claire, Jacob upset you when he took the toy, didn’t he? It made you sad that the toy was taken?” It is important that both children be spoken to about the issue, not just the one perceived as the victim. The teacher would also say to Jacob, “Jacob, it upset you to see Claire playing with that toy. It made you sad. Was that why you took it back?” Speaking to the children about their feelings not only helps them recognize their own feelings, but encourages them to understand the feelings of others. If the children then find themselves in a similar situation in the future, they may remember to consider the other child’s feelings and not lash out so aggressively. Once you have acknowledged the children’s emotions, ask them what happened. Listen to both sides of the story, and make sure each child listens to the other sides too. This once again brings individual feelings to the forefront and encourages empathy. It also opens up discussions of solutions. The teacher could ask Jacob, “What do you think you could have done to get the toy back that wouldn’t hurt Claire’s feelings?” If they need prompting, make suggestions, like how Jacob could have asked Claire for the toy back or how they could have both played with the teddy bear together. 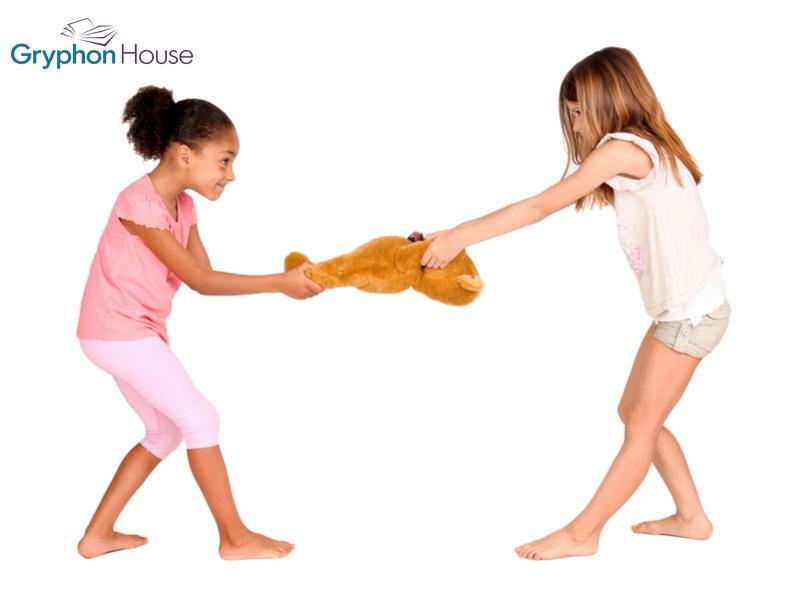 If fighting over a specific item is common in the classroom, introduce other solutions, like allotting how much time each child can have with the toy or remove the toy from the play area entirely. Explain the reasoning and be firm with your decision; even if they don’t always like an answer, it’s important for children to know why a rule is in place, especially with how the rule relates to other people. Teaching sharing may seem like a daunting task in a classroom full of toddlers, but with the right tactics, you can help your classroom grow socially and emotionally.